Interesting story. What do YOU think of this fellow? I just find it odd that he'd have to take a year off to see how going godless fits. I also feel sad that this was the way he had to find out what kind of "Christians" he had thought were his good friends. When you have "faith" there is no need to go looking elsewhere for explanations. Thus the criticism seems justified, tactless and abrasive as it is. I don't see how anyone can go godless. You may reject the concept, but that does not eliminate god from the equation. The test was to see how life is without god. That's a false premise which assumes a god exists so that you may test life against that reference. Testing life without a prior bias is not possible, thus the truth can never be known. The only way to discover the truth is to remove the human element from the evaluation. What is left will clearly reveal the presence or absence of a god. like I said, I don't understand the whole concept of 'trying it out'. it's not like going vegan or dying your hair green for a change, but rather reworking your entire existence system. that meant not going to church, not praying, not believing in creationism, not going to church picnics or saying grace. that had been a lot of commitment; I wonder what he replaced all that time with? Thus the criticism seems justified, tactless and abrasive as it is. but did not jesus specifically say 'love thy neighbour', without any conditions? ergo, they loved the good pastor before, now hate him. that goes right against the whole show and in fact, they did not love him at all, they loved what he represented. "Love thy neighbor" does not apply to evil demons who sin against god. You either are in the club or not. There is no in-between when it comes to religious beliefs. In all fairness I must say that atheists show the same kind of exclusivity in their beliefs. You either are one of them, or you make disparaging remarks about believer in forums like this one. I stand by my statement that the truth cannot be determined by human beings because reality only exists outside the human mind. The good pastor is having second thoughts about his beliefs. It's simple as that. A christian looking at evidence that god exists and finding none? Well, that's something I thought i'd never see. Faith is a strange thing, it can make you believe something because you've been told to believe it without any proof. There is something incongruous about "proving" a belief that only atheists seem to ignore. Not really, we know there is no proof and no way of ever proving the existence of any deity. Never has been and never will be. You are asking the wrong questions. I'm thinking demanding proof of a belief is something less than logical. Beliefs are not based on proofs and never will be. They are just as real as scientific facts but polar opposites. I don't agree. Scientific facts can be proven, a belief can't. Science can say we believe this, and here are the scientific facts to back up our claims. Someone who simply believes can offer absolutely no facts at all, they can't even offer logic. No one is ever born a believer, you're told to be one. Some people can't cope with individuality, so they must conform to group think. 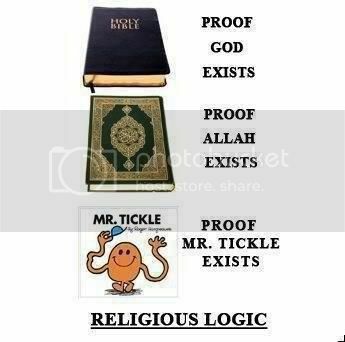 Their is no logic in group think, millions of believers but not one shred of evidence. Christians demand proof from scientists and scientists give it too them. But when we demand proof from christians and christians have nothing, they start screaming anti-christian. Belief itself isn't logical, it's why it's called blind faith. But seeing something scientifically proven right in front of your eyes is logical. So yes, i can see logic in demanding proof from a believer. The fact that they can't, and never can provide proof is not illogical. All it proves is that they believe and nothing more.